Conner Coffin dishes on his background, how he met and recorded an EP with guitar legend Snuffy Walden, and joining Skullcandy. Despite growing up in the paradise of Santa Barbara, California, Conner takes nothing for granted and lives a life of gratitude and hard work. His genuine good energy and love for meeting people has brought him unique opportunities, including working with guitar legend Snuffy Walden to record and release an EP of classic rock covers. 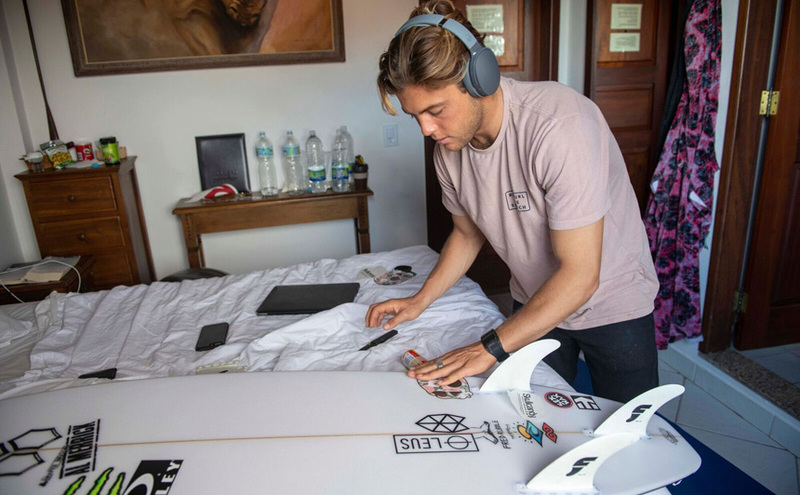 Skullcandy spoke to Conner while he was in Brazil for the WSL tour to welcome him to the team and find out what inspires his constant output of creativity. What was it like growing up in Santa Barbara? How’s the music scene? I spent a ton of time surfing and skateboarding with my brother. As for music, we have the Santa Barbara Bowl here, which is probably one of the best venues in the world. I’ve seen Crosby, Stills, and Nash and Jackson Browne there. We have Soho in downtown, which is a fun little music bar. That’s where my friends play and some good bands come through. I’ve got some friends in bands here, Spoonful, Pleasure, and another called Clean Spill, who’s lead singer also happens to be Pat Curren. Spoonful is more southern rock and Pleasure is a bit more like Sabbath, just heavy and riffy. They’re local bands, but I’m always blown away by how good they are. What’s it like having a brother that’s also deep in the surf scene? Parker has been pursuing more free surfing lately as well as chasing the world qualifying series, but we meet up on tour when we can, and spend time at our family home in Hawaii surfing around the triple crown and Christmas. I’ve always been pushed a lot by him, and surfing came so natural to him, so he made me feel like I had to work harder. I owe a ton to him, and I don’t think I would’ve had the fire to get where I am in my career if I didn’t have him by my side. Touring is the average now. I’m on the road 8 months out of the year. But if I’m home, I just wake up and if there are waves, surf with my brother or friends, grab lunch, hang out and play some music then BBQ for dinner with family or friends. Maybe grab a beer and off to sleep. That’s not my average anymore, but it’s my ideal perfect day. Congrats on releasing your EP, Conner Coffin & Friends. What inspired you to go with an EP of classic rock covers? It’s funny, Stab mag called it “the best dad-rock album of the year”, but I grew up listening to classic rock with my dad, and it’s just what I connected to, whether I’m playing music or listening to it. I don’t listen to a lot of new rap or what’s considered pop music today. Growing up, I’d fall asleep to Metallica. Their Kill ‘Em All album was one of my favourite. I love Sabbath and heavier rock. ASG and The Sword. Punk rock too. As far as playing music, I could never figure out how to sing that stuff, so playing blues and southern rock was what fit in my realm of musical knowledge. How’d you get the opportunity to record and release this mini album? I actually didn’t think I’d have this opportunity, and I didn’t intend to record the EP, but I met some really cool people who encouraged me to do it. This guy Julian who runs the studio I recorded at is one of the nicest dudes I’ve ever met in my whole life. Julian runs this guy Snuffy Walden’s studio. Snuffy had band called Stray Dog in the late 60s and 70s. I think they were before their time –it’s sick and he’s just a radical guitar player. He played with Eric Burdon and The Animals, was partying super hard, and then got sober and started composing music. He ended up doing music for tv shows and found his niche there. So he and Julian do small projects on the side with artists they dig, and they hit me up to come and play with Snuffy one day. I used to surf with his son, so we had met before but it was really random. We had a blast playing and got along really well, and they were like, would you want to record some music here? I said, I’d love to, but I can’t sing. And I haven’t written any songs I feel are good enough to record. So they just suggested we try five or six covers when I get a break from tour. They trusted me and that helped me go with it. It was so fun and we’ll see where it goes from here, but my drive is still with surfing. Music will be something I’ll always love to do and hopefully something I move forward more with when surfing slows down. If you could see any band, alive or dead, who would it be? I’d have to go with the Allman Brothers when they had Duane and Dickey Betts. The original Allman Brothers. Second would be the Grateful Dead back when they were in their heyday in the ‘70s. The Allman Brothers would trump it though. Their Live at the Fillmore performance, I could see that die the next day, and I’d be happy. So what new music have you been getting into lately? I just saw Lucas Nelson and The Promise of the Real in Santa Barbara. He was amazing. I dig the Chris Robinson Brotherhood a lot since The Black Crowes are one of my favourite bands. I never was really into John Mayer, but he’s an insane guitar player, and now he’s playing with Bob Weir and they’re doing the Dead And Company, which is introducing the Grateful Dead to a whole a new generation that would’ve never heard them otherwise. John Moreland, Ryan Adams, The Magpie Salute, The Wood Brothers, King Gizzard and the Lizzard Wizzard are a few more that just come to mind. How does music play a role in your surfing? Music plays a huge role in surfing for me. I have always loved to listen to music before I surf and a lot of the time when I’m out surfing I’ll have a song stuck in my head. Surfing is so rhythmic and music helps get me in that rhythm and flow to surf well. Depending on my mood or the surf, my playlist will vary from something mellow to something heavier to me more fired up. I’ve been listening to a live album by The Black Crowes lately. Music has been a super good way for me to take a break from competing too. It’s nice to renew my creative energy when I’ve just given it all to surfing on tour. There are no rules, it’s not a career. It’s just a lot of fun. Who’s your favourite surfer/musician of all time? I was never inspired to play music by surfers who make music but I grew up listening to Jack Johnson too. Just the other day here in Brazil I heard his music in some restaurant. It’s crazy to think how far his music has gone. I’ve never played music with him or talked to him about music, but we’ve surfed a lot on the North Shore. So I respect him a lot and look up to him. He’s a well-rounded dude. Surfs plays music, has a great family. What more do you want? I’d love to be in that place someday. Tom Curren plays music too and he is my favourite surfer of all time, so naturally, I look up to him as well. What do you think it’d be like to surf with music? I have a friend at home. He’s a kitesurfer, and he’s super badass. His name’s Patrick, and he always surfs with headphones. It’s pretty funny cause sometimes I’ll call out his name and he won’t even look, so I know he has his headphones in. But I’ve definitely thought about it, never done it, but would be into trying it. 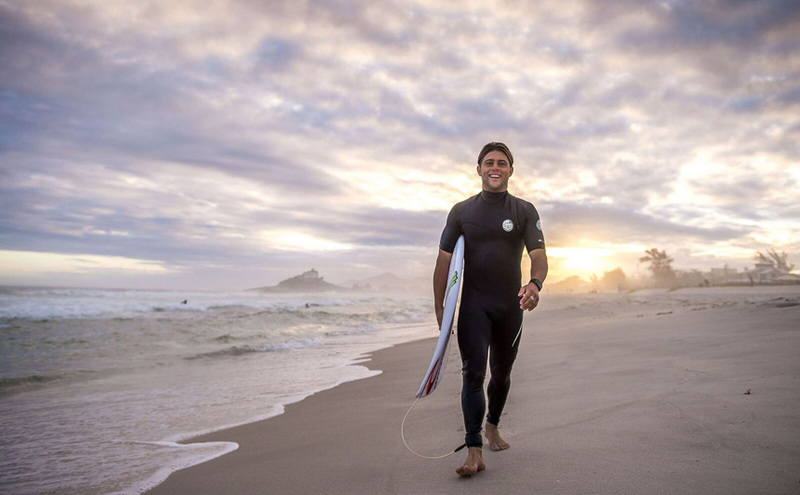 At the same time, for me, surfing is so much about being in the ocean and connecting with it, so it might trip me out. But the thought of it is really cool. What’s most exciting to you about joining the Skullcandy team? The connection with music and boardsports. Skullcandy is super devoted to bridging the gap between those two and that got me super excited. I love the idea of taking music with you too because I’m always listening to it. On the plane, or before my heat, and it means a lot to have good headphones to travel with. Music is a tool, it makes me happy and gets me excited to surf.